Oscar Wilde’s so-called ‘Rolls-Royce’ of English comedies An Ideal Husband returns to the West End, as part of Dominic Dromgoole’s Oscar Wilde Season at the Vaudeville Theatre. Following well-reviewed productions of A Woman of No Importance and Lady Windermere’s Fan, the play promises to be just as entertaining as the rest. Last seen in London at the Vaudeville Theatre in 2010, An Ideal Husband follows the story of an ambitious government minister who glides seamlessly to the top of his political game. That is, until Mrs Cheveley appears with some damning evidence of Sir Robert Chiltern’s history of financial trickery. With vengeful acts aplenty, scandal is afoot in this 1895 comedy. Star casting includes Edward Fox as the Earl of Caversham, Freddie Fox as Lord Goring, Frances Barber as Mrs. Cheveley, Nathaniel Parker as Lord Chiltern, Sally Bretton as Lady Chiltern and Susan Hampshire as Lady Markby. Dominic Dromgoole’s Oscar Wilde Season is a year-long celebration of the famous playwright, whose work remains strikingly relevant today. Other productions in the season include The Selfish Giant and a revival of the classic The Importance of Being Earnest. With star-casting including Jennifer Saunders and Eve Best, amongst many others, the season sees renowned actors come together to present some of Wilde’s best works. 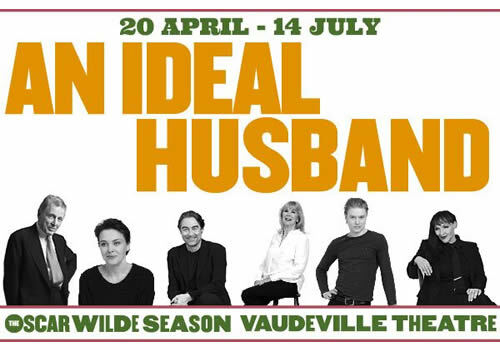 Playing at the West End venue for a strictly limited season, An Ideal Husband runs at the Vaudeville Theatre from April 20th to July 14th 2018, with an official opening on May 3rd 2018. An Ideal Husband is recommended for those aged 8 and up.